Seasons Greetings! Below find a quick list of some great holiday reads. I’m sure many of these are familiar, so I’ve included additional information to present some of these classics in a new light. Here’s to hoping you find some time after finals to enjoy them, and many other holiday indulgences here in New York City or wherever you celebrate. Wishing you all a warm holiday, a peaceful new year and a generally fantastic winter break! The Gift of th e Magi. This classic O’ Henry tale can be enjoyed by all ages. (I actually read it in its entirety to my 3rd graders one year. ) The magi (or wisemen) may have officially invented gift giving, but the couple who headlines this story perfects it. Famously romantic and inspiring, this is a great read for anyone struggling to find that perfect gift…Click to read it on google books. Thomas’ 1955 poem recounts his Christmas experiences in Wales. Originally written for radio, this makes a great read aloud or you can listen to Thomas read it himself through NPR. (Warning: this is not exactly a feel good holiday story, this is Dylan Thomas…) Click to read it on google books version or borrow from the TC library. Perhaps my favorite of all Christmas stories, Dickens’ A Christmas Carol, in all of its incarnations as a book, theatre performance and movie, has never disappointed me. Did you know Dickens wrote this famous novella over a 6 week period in 1843? Visit the Morgan museum to see his original manuscript on display- up through Jan. 9th. Click to see digitized slides of the manuscript with edits, omissions, and other notes. Truly the gift that keeps on giving. Walking on Air has been interpreted many times, perhaps most famously by George Winston. Click to view the sheet music for his Snowman Box Dance set (from Forrest, his solo album.) Listen to it, for a fee. Click to borrow the book from TC. You guessed it! Polar Express was written by Chris Van Allsburg in 1985, won a Caldecott Medal a year later, and was turned into an oscar nominated motion capture movie in 2004. What I didn’t know about the Polar Express is that there are train rides, Polar Express train rides, designed to simulate the protagonist’s experience that memorable Christmas Eve night. Anyone have a small child I can borrow? Щелкунчик, Schelkunchik or The Nutcracker is a two-act ballet, originally choreographed by Marius Petipa and Lev Ivanov with a score by Pyotr Ilyich Tchaikovsky. It is adapted from E.T.A. Hoffmann’s story “The Nutcracker and the Mouse King”. TC has a copy of Hoffman’s original. This winter, American Ballet Theatre’s artist -in -residence Alexei Ratmasky is staging The Nutcracker to the entire Tchaikovsky score. Check it out at BAM. Interested in other interpretations? Here is New York Magazine’s guide to the pletora of Nutcracker performances in NYC. This American Life broadcast the original recording of Truman Capote reading his story. Click to listen or purchase. For those of you headed to the Bay Area, Theatreworks in Silicon Valley is staging perforamances of this work through Dec. 26th. This famous Christmas poem by Clement Clarke Moore was originally titled “A Visit From St. Nicholas” and published for the first time on Dec. 23, 1823 by The Sentinel, a New York newspaper. Legend has it he wrote the poem on Christmas Eve in 1822 on his sleigh ride home from buying a turkey for his family. He didn’t copyright the poem and, at the urging of his children (for whom it was written) only claimed it was his more than 20 years after it was published. Some scholars question whether Moore wrote the poem or if it was created by Major Henry Livingston Jr.
Fun Fact about Clement Clarke Moore….he was a graduate of Columbia College (1798), and his father, Reverend Benjamin Moore, was formerly president of Columbia University. Need a little (okay, a lot) of sentimental, feel-good holiday magic this season? Spend the holidays with angels, James Stewart and Donna Reid! Of course, you could read (re-read?) 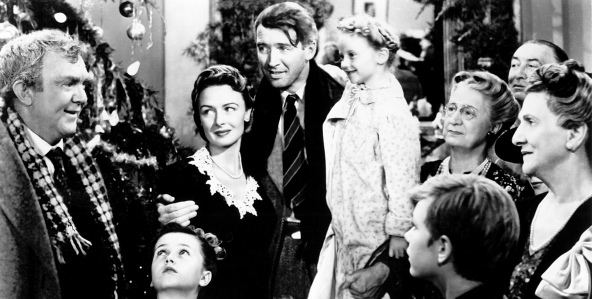 the book, but every year the IFC center features It’s a Wonderful Life on the big screen…check it out this weekend! 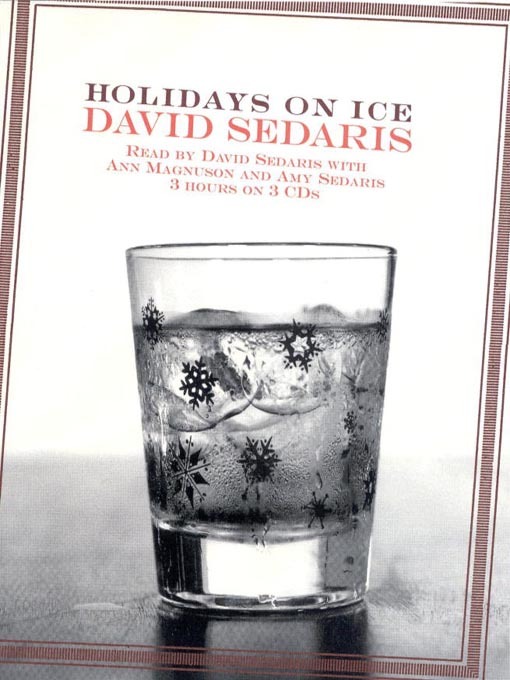 Holidays on Ice is a collection of stories including SantaLand Diaries highly recommended as an adult read aloud. Nothing says holiday spirit like a fireplace, eggnog, and family gathered around the tree for a reading of Dinah, The Christmas Whore. From my home to yours…have a wonderful holiday.